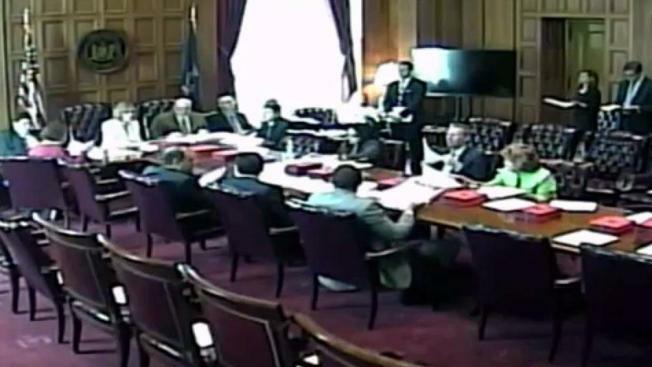 Lawmakers in the New York State Senate almost never vote on controversial bills, according to an analysis of thousands of bills brought to committee votes in 2017. Chris Glorioso reports. Lawmakers in the New York State Senate almost never vote on controversial bills, according to an analysis of thousands of bills brought to committee votes in 2017. The I-Team tallied votes on more than 2,200 bills in NY Senate committees this year and found just 12 of them were voted down. That's a 99.5 percent approval rate. But the high approval rate does not take into consideration the hundreds of bills that never make it to vote. For example, this year the powerful Senate Finance Committee approved each of the more than 200 bills that came before members. But Chairwoman Catharine Young (R-Olean) declined to put a bill on the voting calendar that would have guaranteed military veterans a break on their school property taxes. Playing hooky from school will generally get you bad grades. Skipping work might get you fired. But if you are a New York state senator, skipping your committee meetings is practically the norm. Chris Glorioso reports. Though virtually every legislator professes support for war heroes, the tax break for veterans was bottled up in committees in 2015 and 2016 as well. Young told the I-Team she's keeping the bill from a vote because she needs more time to consider fiscal impacts of the proposal. "We need to understand what the price tag is. We need to know what implications there are for the state budget," Young said. The continued blockage of the veterans tax exemption bill was a disappointment to a group of Westchester County war heroes who have been pleading with Senate committees to take a vote on the issue. "There's a thing in the morning in the military. It's called roll call!" said Stephen Wittenberg, a Vietnam War veteran. "It speaks to a larger issue that they haven't been leveling with us," said Frank Pagani, a US Air Force veteran. Bill Rudy, a 93-year-old veteran who flew 35 bombing missions over Europe in World War II, said after three years of inaction, he's starting to think he'll never see Senators forced to take a vote on the veterans tax exemption. Some New York state senators are earning thousands of dollars for assignments to committees whose meetings they don't attend. Chris Glorioso reports. "They get credit for the idea, it seems to me, and then throw the ball to somebody else."